A movie’s runtime is a tricky thing to get right. Make it too long, and it feels overwrought and indulgent (hi there, Batman v Superman). Too short, and you have a rushed story which doesn’t do justice to the characters or the setting, as any The Dark Tower fan will tell you. With the exception of one or two anomalies, the Star Wars films have always been pretty good at hitting the sweet spot of a decent runtime, but Star Wars: The Last Jedi is striding into uncharted territory with its theatrical length, which director Rian Johnson revealed in an interview last week. Talking at a press conference in France, Johnson announced that the runtime for Star Wars 8 is 150 minutes, including credits. That’s 2 hours, 30 minutes in total, officially making it the longest Star Wars movie so far (it just beats Revenge of the Sith, which came in at 140 minutes upon release in 2005). Unless you’re someone who struggles to stay awake at the cinema, this news is both encouraging but hardly surprising. 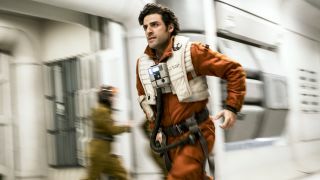 We already know that The Last Jedi plans to answer a lot of burning questions about the franchise, all while telling an epic and multi-layered story rife with twists and turns, so this higher runtime will hopefully give it just enough breathing space to achieve its purpose as the bridge between The Force Awakens and Star Wars 9. Speaking of Episode 7, that movie came in at a much leaner 124 minutes, so it’ll be interesting to see how the two compare once The Last Jedi finally hits theatres on December 14 in the UK and Australia, and December 15 in the US. Excited to witness two and a half hours of undiluted Star Wars goodness? Or nervous about whether it might overstay its welcome? Let us know in the comments below, and whet your appetite with this tantalising new TV spot.